Homepage. This page: An early copy of this American motoring publication, dating to the late 1950s. A rare copy of this US motoring magazine from June 1958. Stuchamp, from the site forum, kindly sent me this magazine from the US some years ago now. "Foreign Cars Illustrated" isn't a publication I'd heard of prior to then, the cover stating that it was aimed at ".. owners and prospective owners of the world's most sensible cars!". Quite what the bigwigs down in Detroit, or 'motor city', made of this is anyone's guess. With most buyers in America staying loyal to home-grown motorcars, many of which were large enough to have their own postcode (zipcode! ), and with thundering great V8s warbling away under the bonnet (hood), I'm surprised there was much of a following at all for imported family-oriented cars in the 50s, except perhaps for European sportscars, which by this time were well established in the States. This is an early copy - Volume 1 No.3 - I'd be interested to find out just how long this magazine title survived for, especially as this early copy has few advertisements in it to help swell the coffers. In fact the only ads I could find in this small-format magazine were for Motometer Precision Instruments, the Four-Way Welder, Ramcote Flexible Finishes (see advert further down this page), and the Judson Supercharger (specifically for the VW Beetle). 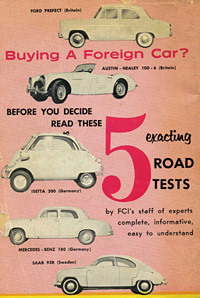 June's issue contained the following roadtests amongst a smattering of other articles - Austin Healey 100/6, Ford Prefect (100E type), SAAB 93B, the Isetta bubble car, and the smart Mercedes-Benz 180 sedan. Of this bunch, the Healey would I'm sure be the most attractive to the US buyer, leading the way for other burly sportscars that found their way to the US in later years, including the E Type Jaguar (XK-E), the MGB and various big-engined Triumphs such as the TR5 (TR250), Triumph already doing well of course in the US with their TR range, beginning with the TR2 of 1953. "Nothing could leave a worse taste in American mouths than such shenanigans. If permitted to continue, they could destroy the good will your fine cars have built for you. Such gouging could also ruin the powerful appeal of the low price tag the imports now carry. Motorists are sick to death of mortgaging themselves for years every time they buy a new car." First article in this issue is headed 'Imports at Daytona', and reviews an interesting event held in the Daytona area. Apparently 183 foreign cars turned up for the event, named 'Daytona Speedweeks'. Events began at nearby Flagler Airport, with what sounds like an autotest taking place, requiring drivers to accelerate away, stop straddling a line, reverse, and perform a number of other routines, before repeating the same course a further three times. The author took part in the Speedweek, in his own Volvo PV .. seemingly doing quite well in the face of opposition from US-made cars: "The Detroiters burnt their brakes and clutches without the slightest trouble, while our Volvo held fast all the way". No imports won any prizes though! Domestic and foreign cars then gathered at Daytona Beach, to perform timed runs along the measured mile. The aforementioned Volvo clocked a maximum of just over 93mph, which doesn't sound like bad going at all. Unfortunately for the trusty journalist and another Volvo-owning friend, both their cars were lumped into the same class as much larger-engined vehicles, a 3.4 Jaguar whipping their butts in the end with a 112.8mph average. However the Volvo duo had the last laugh, as to achieve this maximum, the cad in his Jagoooaaarrr taped over part of the (already small) grille, to lessen wind resistance, but this had the unfortunate by-product of causing the engine to boil up, the 'overheated engine throwing oil under the hood like a tired 'T'" (whatever one of those is??). Photos with the article show some other motors familiar to British motorists, including a Minor Traveller, an XK Jaguar, and a Sunbeam Rapier, all taking to the Daytona sand. "But most spectacular event of the 40 lapper was a spill taken by a Renault Dauphine. After madly cornering through a couple of 'S' curves the little sedan had to make a hard left, started to slide and seemingly blew a right rear tire. Over and over the little blue job tossed, three times in all, finally landing on its wheels to roll off the track and nose into a pile of dirt. The driver, tossed around like an ice cube in an empty glass, was hauled off for an inspection and repair of a damaged nose and sundry bruises." Recovering from this exciting read, the foreign car enthusiast would turn over the page and be presented with a front-on view of the first car to be roadtested in this issue, a two stroke SAAB 93B. To say that they liked it is an understatement, their praise for this little tin-top from Sweden was gushing to say the least. 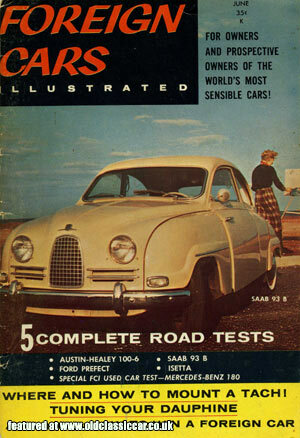 They seemed impressed with some of the SAAB's quirky features, and improvements made to the original 93 first seen in the US in 1953. Features of note include a rear seat that had three height positions, and the front pair could be arranged into a handy double bed, just the thing if stuck miles away from a motel at night! Favourable quotes include "its body is neat, trim and completely devoid of garish frippery ... at idle the popping exhaust sounds like a percolating coffee pot ... it has no tendency to wander, stray or gallop." The test ended with these words, obviously penned by someone who was rather fond of this percolating Troll: "And in this summation, we can say we had only two regrets: 1. The car wasn't ours, and 2. we couldn't keep it longer." Praise indeed. Next up, a feature on a car rarely seen in the UK yet alone cruising the boulevards of California - the Peerless GT, a sporting machine named after the American trucks of that name that were assembled some thirty years earlier in the same factory, in Slough, Berkshire. It featured a spaceframe chassis, disc front brakes, and oily bits lifted straight from Triumph's TR3 catalogue, the engine, gearbox, front suspension, brakes, wheels, instruments, steering gear all being sourced from the Canley factory. One photograph shows two people who were perhaps most keen of all for the car to succeed, namely racing driver John Gordon (MD of Peerless Cars Ltd) and Bernie Rodger, the car's designer. Hindsight now tells us that the car didn't really sell in the numbers hoped for, despite a successful outing at Le Mans in the same year as the magazine (1958), and a bulging order book from early on, which the company struggled to keep up with. Peerless Cars finally went into liquidation in 1960. The design would enjoy a re-birth sometime later, as the Warwick, but surviving examples of either car are scarce now. The car featured in the magazine was registered 333 CBH, the first prototype of the new car. Did it survive? Next car featured enjoyed a very successful existence in markets around the world, in various incarnations - the Austin Healey. For 1958 it was the 100/6 that was doing the rounds with roadtesters either side of the Atlantic, its looks and performance finding favour with most people who experienced it. A few minor grumbles were highlighted, including some instability at high speeds, seats that were a little on the thin side of comfort, and a hood which was "typically bothersome to put up and down". Overall though they gave it a big thumbs up. Of course not all imports were shipped over from Britain, and this is ably illustrated by the next car featured - the Renault Dauphine. Rather than a roadtest, this article goes into the detail of how to keep your Dauphine in fine fettle, properly tuned, and in good all round order. "We recently put about 800 assorted miles on one of Fine Cars Inc's Prefects in the space of three weeks, and if the car had a little more power and a little more beauty, it would have required an anesthetic to separate us. 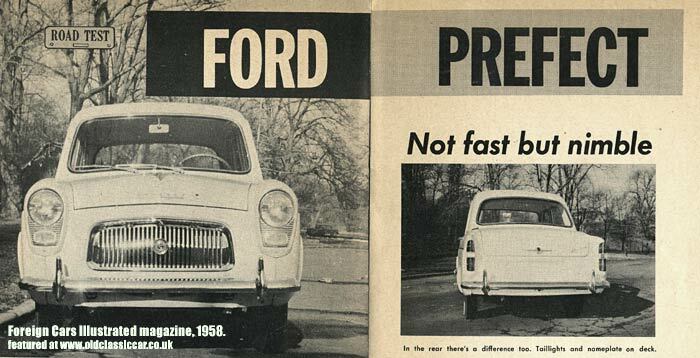 The Prefect is the second smallest of Ford's English Line. In essence it is a four-door Anglia. Either that, or the Anglia is a two-door Prefect. Whichever is the case, the Prefect stretches 12ft 7ins from bumper to bumper, displaces 1174cc (that should read 1172..), puts out 36 horsepower, and handles like a soft lead pencil on good rag paper". Not quite sure what that means, but I think it was a compliment. Overall in fact they were quite keen on the boxy Prefect, even after having some reservations about its lack of 'go', summing up with these words: "It is one of the most pleasant cars to drive we have ever encountered". The following few pages are given over to the exciting topic of where to mount an after-market tachometer, using a variety of import motorcars to illustrate their article - including Hillman, Renault, Simca, Volvo, Morris, and Fiat. So far the magazine had covered sporting carriages, such as the Healey and the Peerless, and family runarounds such as the Dauphine and 100E. Now it was the turn of the quality machine, ably represented by the 'Ponton' series Mercedes 180, the car featured being a 1955 example with 37k miles on the clock. Throughout the article the author returns to the feature that perhaps best impressed him of all - the vehicle's durability, things still working just as perfectly as they did when the car was new. Ok it was only three years old, but it wasn't unknown for cars to start showing a few faults by that age back then, and much the same is true today. Following the M-B article is a lighthearted look at the automotive 'gymkhana', or 'car rodeo', which is not dis-similar to the autotests that take place at club meetings now, where driver and crew are timed around a set course, and required to perform a number of manouevres and challenges along the way. The article is illustrated by a chap dangling out of the passenger seat in a Riley RM, attempting to spear a potatoe on the end of a pole. Sounds like a lot of fun to me! To many people the car subjected to the final roadtest, is more of a 'fun' machine than one to take too seriously - the BMW Isetta 300. Presumably average waist sizes were less expansive back in 1958 than the average today, otherwise such a machine would have found very few buyers anywhere I'd have thought, even though it offered cut-price motoring in a pint-pot package. As a metropolitan runabout the roadtesters seemed to rate the little car, taking advantage of its Dinky-like dimensions by parking and photographing it stopped nose-in to the kerb, between two conventionally-parked early 50s Detroit-built cars. The remainder of the magazine is given over to a letters page, a technical article about RPM vs MPH vs wheel & tyre sizes, and a handful of motoring advertisements. 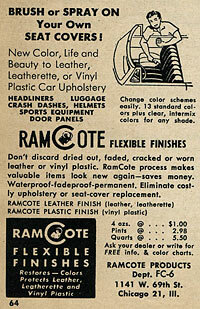 An issue of Motor Life, another American automobile magazine and also from 1958, can be found on this page.